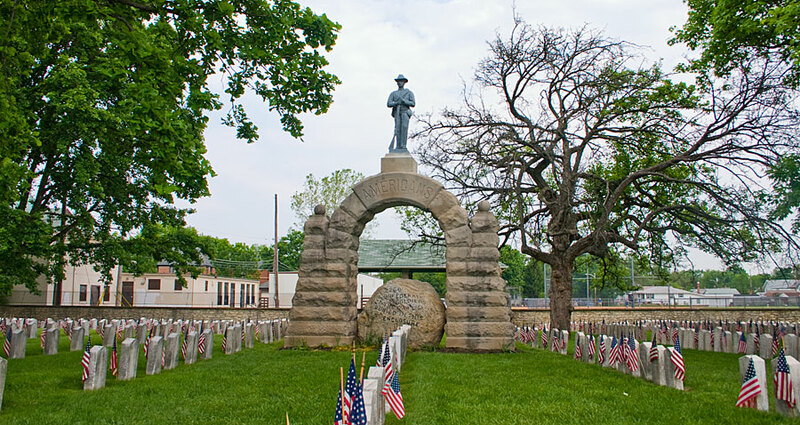 Offered is an outstanding photograph of the Confederate monument dedication at Camp Chase, Ohio POW cemetery. 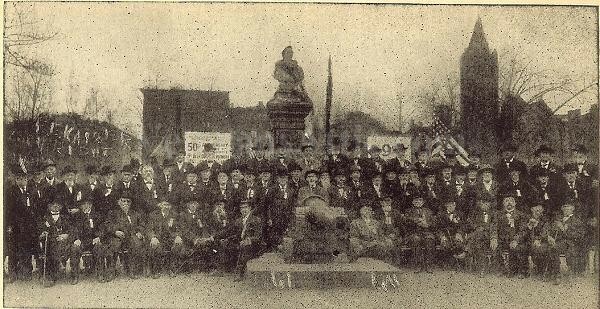 This hard to find photograph has the monument with a banner saying "AMERICANS" over it with American flags. 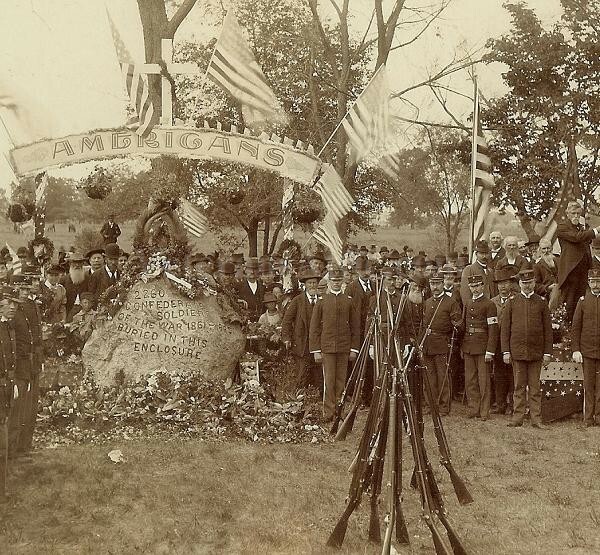 Rifles are stacked in the front of the photograph. What looks like Ohio National guard are on either side of the monument. W.H. Knauss and W.B. Albright are shaking hand to the right of the monument. 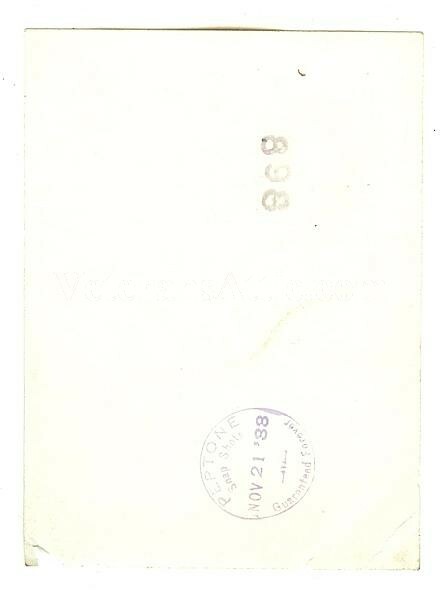 On an attached slip of paper on the back of the photograph, it says "W.H. 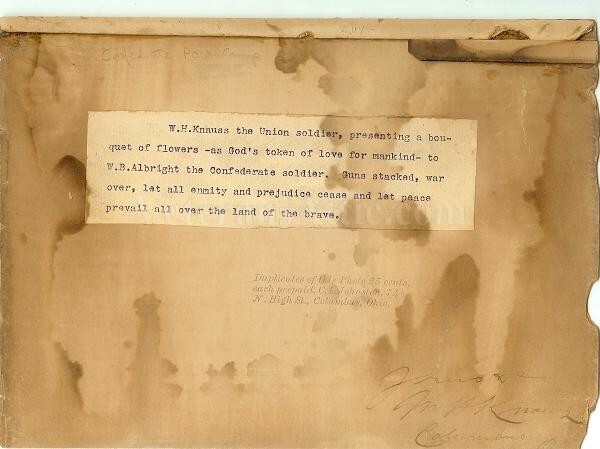 Knauss the Union soldier, presenting a bouquet of flowers - as God's token of love for mankind - to W.B. Albright the Confederate soldier. Guns stacked, war over, let all enmity and prejudice cease and let peace prevail all over the land of the brave. Stamped on the back of the photograph is "Duplicates of this Photo 25 cents, each prepaid. C.L. Johnston. 74 1/2 N. High St., Columbus, Ohio.". The photographer Johnson and W.H. Knauss signed the photograph in the right bottom corner. At the monument dedication the zinc Confederate soldier was not attached. This is the part of the statue that has recently been defaced. The actual photograph is approximately 8 inches by 6 1/8 inches. The board portion of the photograph is approximately 10 1/8 inches by 7 1/8 inches. There is a thin wooden support to the top of the photograph. A century ago, 358 E. 15th Ave. was the home of a noteworthy Columbus citizen and American patriot, William H. Knauss. Back in 1861, 22 year old William Knauss jumped at the opportunity to join the Union Army. Within weeks of the attack on Fort Sumter, Knauss was mustered into the 2nd New Jersey Infantry and off to war. 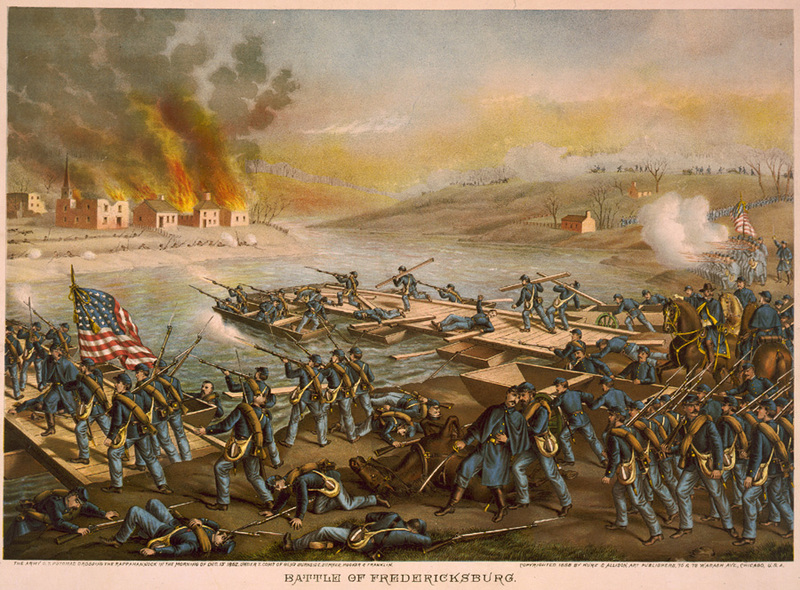 The 2nd was on the field at Second Bull Run (August 1862) and Antietam (September 1862) but the soldiers saw their first real action at The Battle of Fredericksburg in December. The battle was a folly and a slaughter. Even though the battle's objective was already lost, foolish general Ambrose Burnside committed Union forces to repeated head-on assaults across an open field and up a hill in the face of dug-in and well-armed Confederate defenders. The result was a massacre. Union forces were mowed down by Confederate artillery and rifle fire. The senseless carnage was so great that Confederates reportedly begged the advancing Union troops to stop and save their lives. On the terrible day of December 13, 1862, over 1,200 Union soldiers were killed and more than 9,000 wounded. Among the wounded was William Knauss. A shell fragment struck him in the face. An inch to one side and he would have been killed. He bore an ugly scar from the wound for the rest of his life. Knauss carried something else away from the battle. For many years, W.H. nursed a hatred for the Rebels who had slaughtered his comrades and fired the shell that nearly ended his life. All that changed on a business trip to North Carolina in 1868. Knauss met a fellow veteran of Fredericksburg. The man was a Confederate and he had lost his leg in the fight. He and the Southerner became friends and shared their memories of that blood-soaked December day. Knauss came to see the Confederate soldiers as brothers who had suffered in the war just as he had. When he and his new friend parted, they pledged to each do their best to look after the other's comrades if ever they were in a position to help. 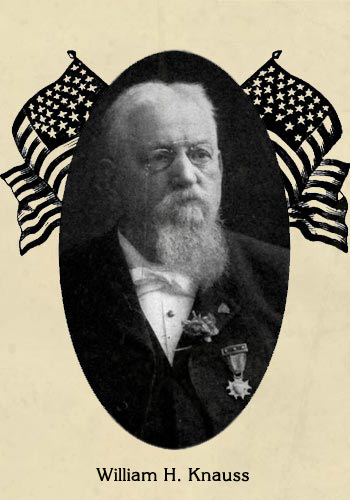 In 1892, Knauss moved to Columbus. He and his son-in-law began buying, selling, and developing real estate. They were successful and built up considerable wealth. In 1893, Knauss built a fine home on E. 15th Ave., one of the first in the University District. One fateful day, business took Knauss out on Sullivant Ave. on the western edge of the city. There he saw the sad condition of the Camp Chase Cemetery. During the Civil War, Camp Chase had been a prisoner-of-war camp for Confederates. It stretched from W. Broad south to Sullivant and from Hague Avenue east to Demorest. At its peak, it had been home to nearly 10,000 Confederate prisoners-of-war. A smallpox epidemic in 1863 and overcrowding and a hard winter in 1864-65 took its toll on the inmates. When the war ended and the POWs returned home they left behind more than 2,000 dead. After the war’s end, the camp cemetery was forgotten. Bitterness among Union veterans and politicians made care of Confederate graves an unpopular cause. Weeds and briars grew high on the grounds. Wooden grave markers rotted away. Gophers and rabbits made their homes among the decaying monuments. Developers cast greedy eyes on the acreage and wondered how it might be converted to more profitable use. Knauss was appalled and began the project that would become his life’s work. They were American citizens, they were men, they had mothers and sisters, some had wives and children, all praying to one God and Father; and O how many a prayer went up that these unfortunate dead might be returned to their homes! Alas! the fate of war decreed otherwise and where their bodies lie is in many instances unknown to their loved ones... If I were in the South and saw an ex-Confederate do honor to an unknown Union soldier's grave, I would say with all my soul" "God bless you and yours forever!" He wrote to politicians, complained in letters to the editor, contacted Southern veterans associations, toured and lectured, raised funds, spent freely from his own pockets, and even put his own back to work in the cause of restoring the cemetery to a decent condition. 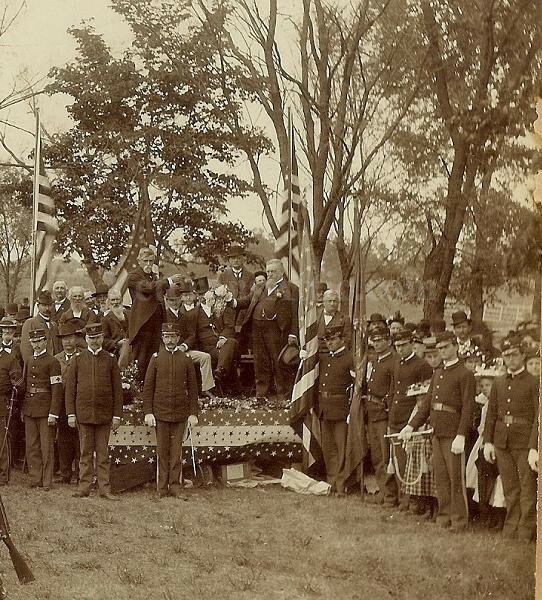 In 1895, Knauss conducted the first Memorial Day ceremonies on the grounds with little more than his own family in attendance. His campaign was not a popular one in the North. Though the war was thirty years past, feelings still ran high. Union widows and orphans attacked him as a traitor. Survivors of the inhumane Southern prisoner-of-war camps asked how he could forget their suffering. 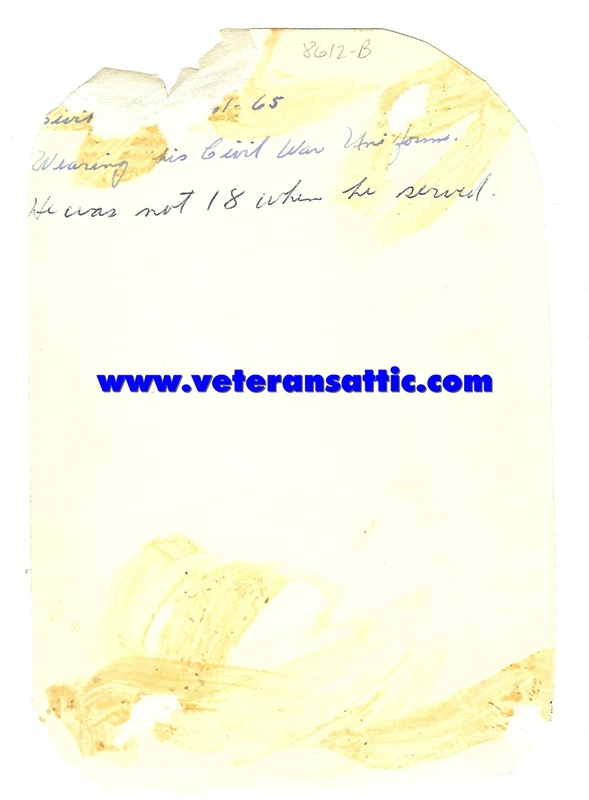 Northern veterans' groups were openly hostile. Knauss lost business and received threats of violence and even death. Decoration Day ceremonies 1898 from Knauss' book The Story of Camp Chase (1906). His patriotism was questioned. An ad hoc committee formed among legislators at the Statehouse and demanded he present himself and give an account of his actions. He refused. They threatened him with dire consequences he did not cease his activities. Several times, guards had to be posted at the cemetery against threats of vandalism. Once, attackers threatened to destroy the place with dynamite. Despite this, Knauss persevered and his campaign bore fruit. The weeds and brush were cut and arrangements made to have the grounds cared for. Flowers and ornamental trees contributed by Southern states were planted. A solid stone wall was erected around the burying ground. Rotted or decaying wooden markers were replaced with stone ones. 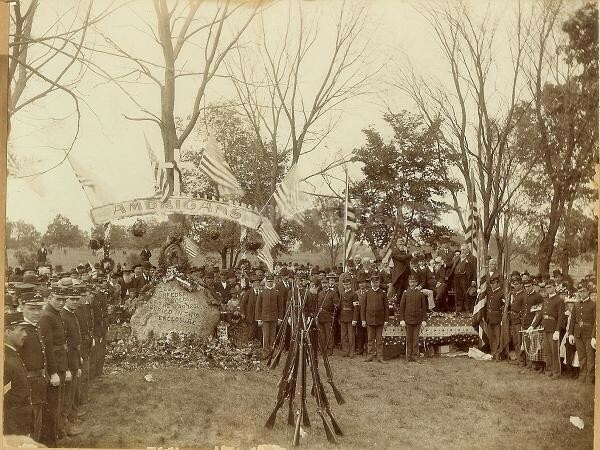 Each year, Knauss arranged a memorial service at the grounds on Memorial Day. Each year, the size of the audience in attendance grew. Each year, more local and state notables were willing to appear. In 1897, the mayor was in attendance. In 1900, the governor came and said a few words. 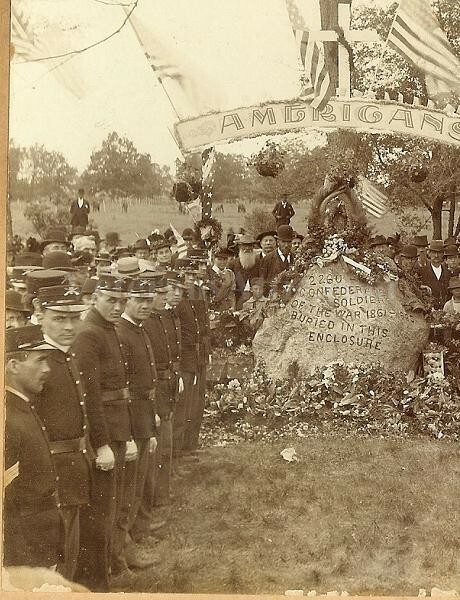 In 1897, an inscribed boulder was placed there as a collective memorial. The text read "2,260 Confederate Veterans of the War 1861-1865 Buried in This Enclosure." 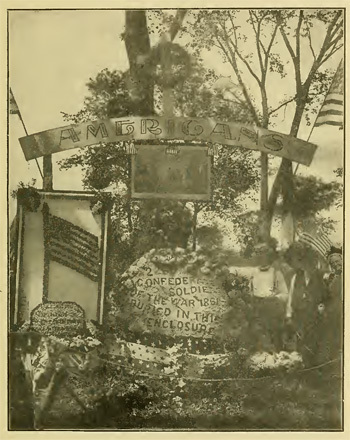 In 1902, a memorial arch inscribed simply “Americans” was added as tribute to the fallen. 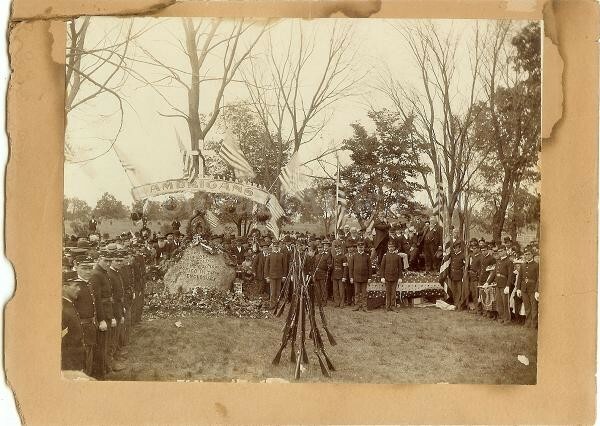 After the dedication of the arch in 1902, an aging Knauss turned over preservation of the cemetery and organization of the annual memorial to the United Daughters of the Confederacy. He wasn't quite done though. His travels and encounters had made him something of an expert on the camp. In 1906, he published The Story of Camp Chase, the definitive history on the subject. Based on diaries, letters, and interviews with prisoners and guards, the book chronicles the story of life in the POW camp. It tells of the inmates' loneliness, hardships, privations, disease, escapes, attempted escapes, conspiracies, occasional moments of joy and fellowship, and the ever-present mud. The volume also records the history of Knauss' efforts to restore and preserve the burying ground. Knauss spent the rest of his years supporting various patriotic causes. It’s said he spent much of the remainder of his fortune providing free American flags to any school that wrote him to ask for one. ...the men and women of the South always speak one name with tender reverence and admiration, that of Col. W. H. Knauss, of this city. We call him great and good, with his patriotic heart overleaping all the prejudices and passions of war and inaugurating the decoration of these once neglected graves and pleading for a wider and broader spirit and for writing over their dust the magic word "Americans." There is no place in all the Southland where the name of Colonel Knauss does not evoke the affectionate remembrance of its people. 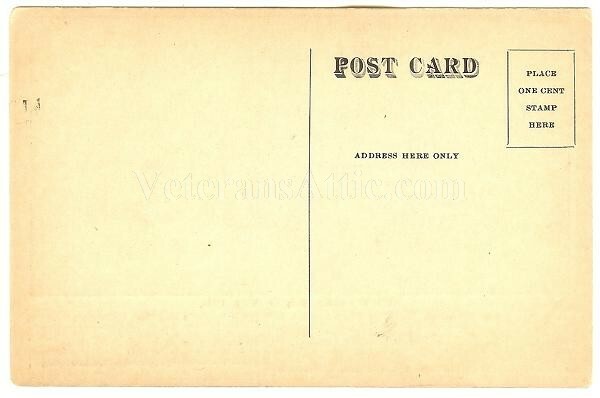 A nice cabinet card of a Grand Army of the Republic Union Veteran from Lowell, Massachusetts. The veteran is wearing a four button G.A.R. 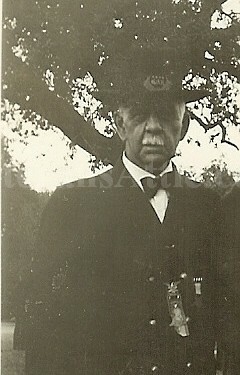 uniform coat and his GAR membership badge. The photographers mark is "Hayden - Lowell, Mass.". A wonderful photograph of the Grand Army of the Republic National Commander Russell C. Martin. Martin was National Commander from June 1933 until the end of his 1934 term. 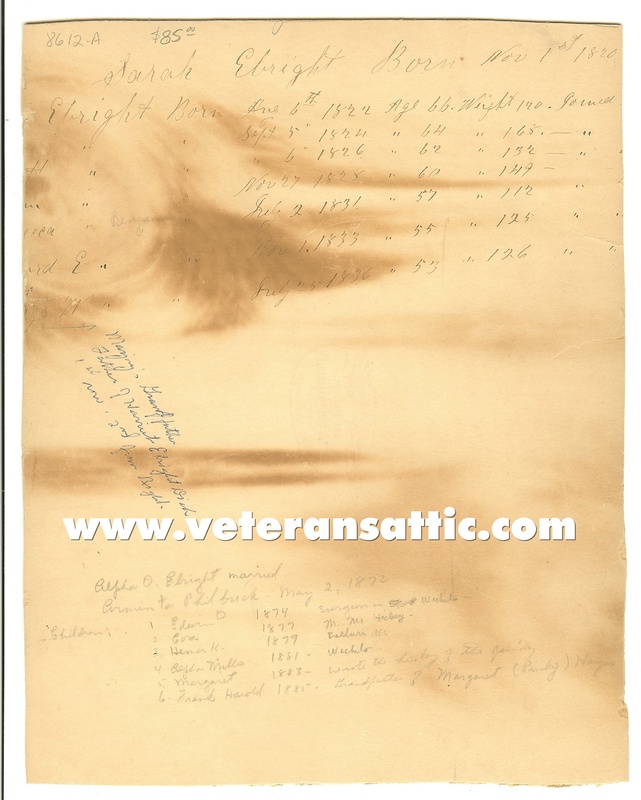 He filled in in 1933 after Commander William P. Wright died in office. This photograph has Martin standing with his wife. Martin is wearing two badges. He is wearing his 4 star Commander-in-Chief badge and a 2 star Department Commander presentation badge. He also has four stars on his hat wreath over the G.A.R. The photographers stamp on the back is "Peptone Snap Shots - Guaranteed Forever - Nov 21 '33". The photograph is approximately 4 inches by 3 inches. 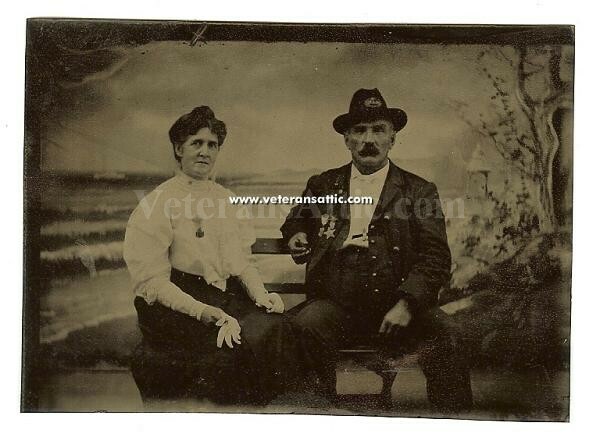 A nice tintype of a Grand Army of the Republic veteran and his wife seated. 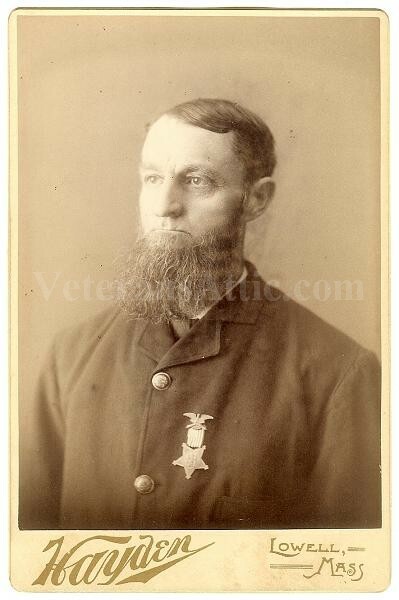 The veteran is wearing a GAR membership badge and a Massachusetts GAR Department badge. He is also wearing a hat with a GAR cloth piece with the Post number on it. His wife is wearing a WRC badge. 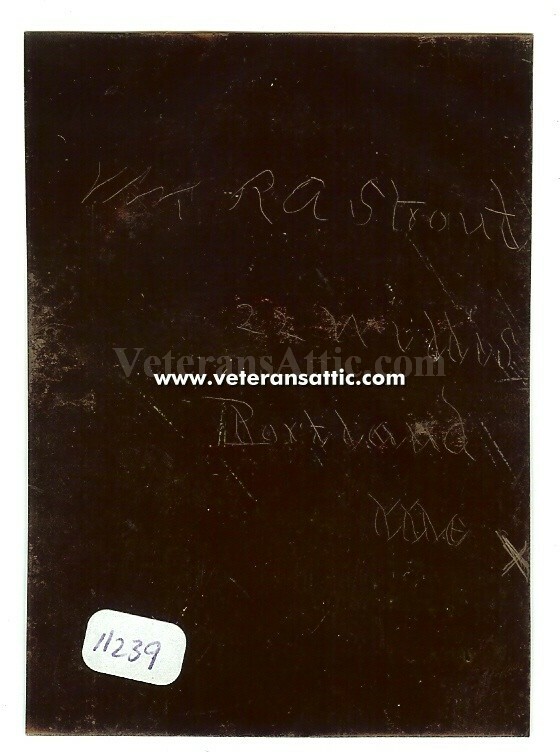 On the back of the tintype is scratched "R.A. Stroud - Portland, ME". A great photo of a Grand Army of the Republic post. 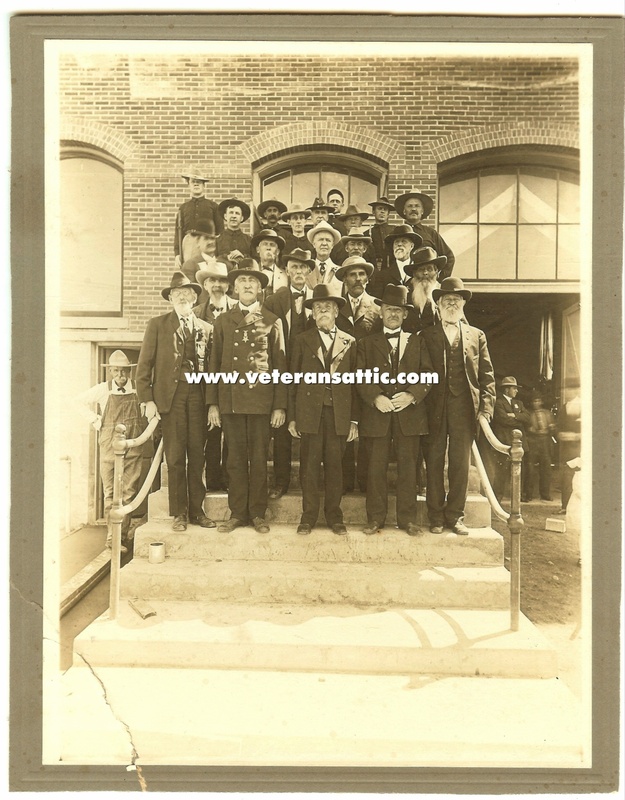 There are several Spanish American War soldiers behind the old Civil War veterans. The photo is approximately 8 5/8 inches by 6 1/2 inches. The gray board has been cut down and it measures approximately 9 1/4 inches by 7 5/16 inches. The corner on the bottom left has been broken but is still attached. This does not affect the image of the old soldiers. A nice group with a large photograph of a group of older men with two women. 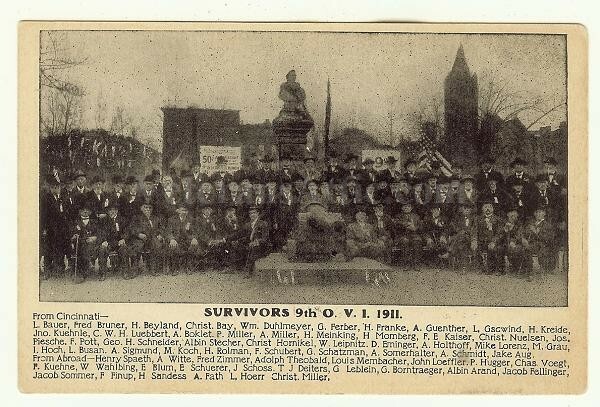 The man seated on the left is wearing a GAR uniform and his GAR membership badge. The other men are likely veterans but I can ssee no badges or lapel pins. In front of the men is a stereo viewer with a stack of stereo views. The photograph is approximately 8 inches by 10 inches. On looking at the back there are names but unfortunately the photo has been trimmed and some of the first names are gone. The family's last name is Ebright. 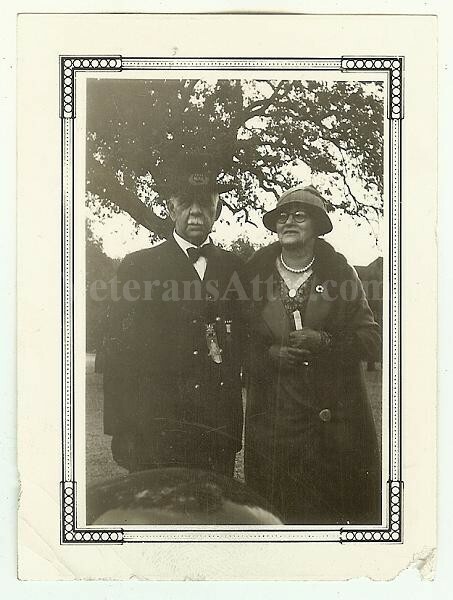 With the photograph is another photograph which is a 1920's copy of an Union soldier's CDV. This photograph is approximately the size of a cabinet card. 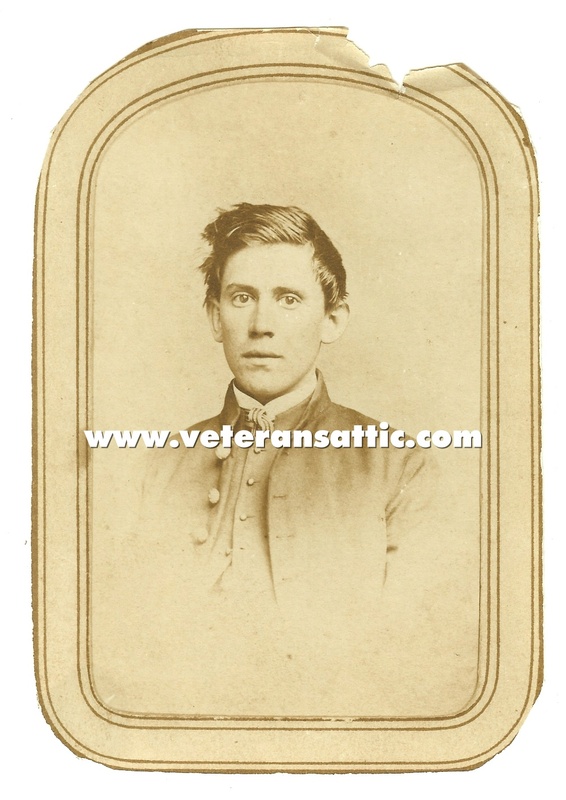 On the back of this photo is "Wearing his Civil War Uniform - He was not 18 when he served." Unfortunately this photograph was trimmed also. A nice grouping. 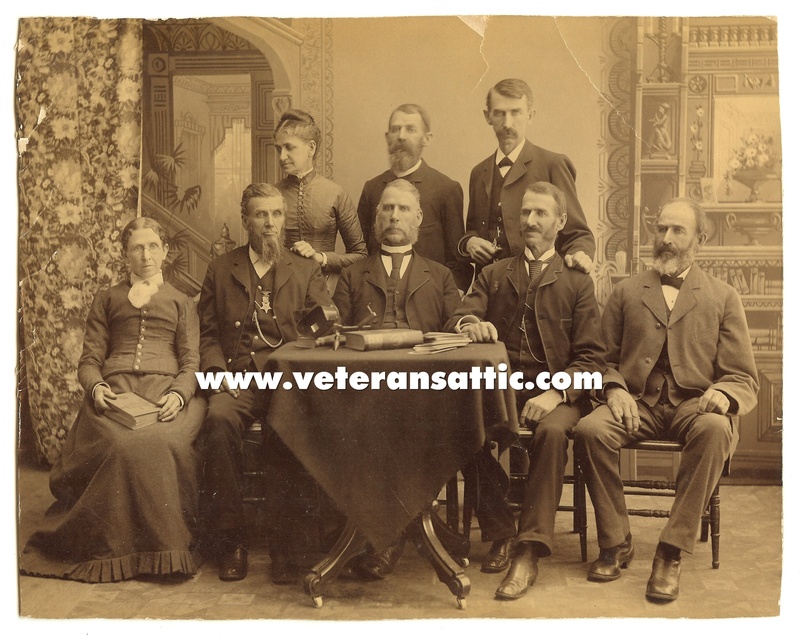 A nice tintype of a GAR veteran with his family. The veteran is in the back and you can clearly see his post officer's badge! The tintype is approximately 3 5/8 inches by 2 3/8 inches. 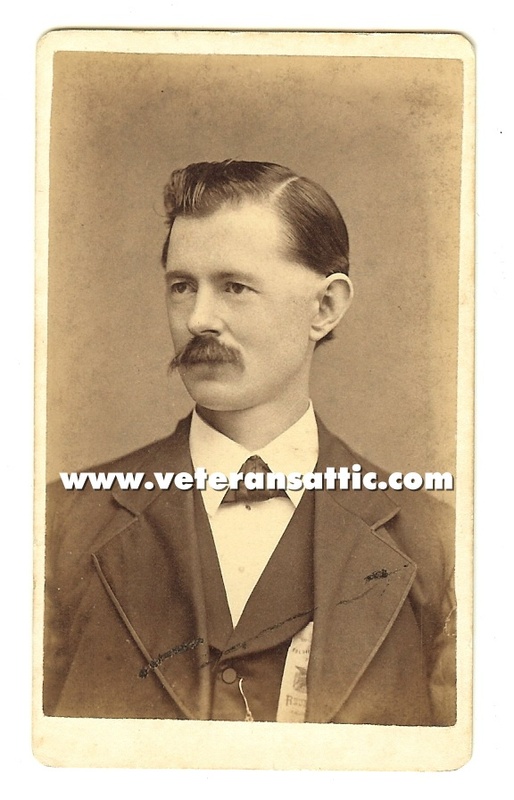 A nice CDV of an Union veteran from Ohio. He is wearing a Soldier & Sailor Reunion ribbon. The back mark on this CDV is "L.M. 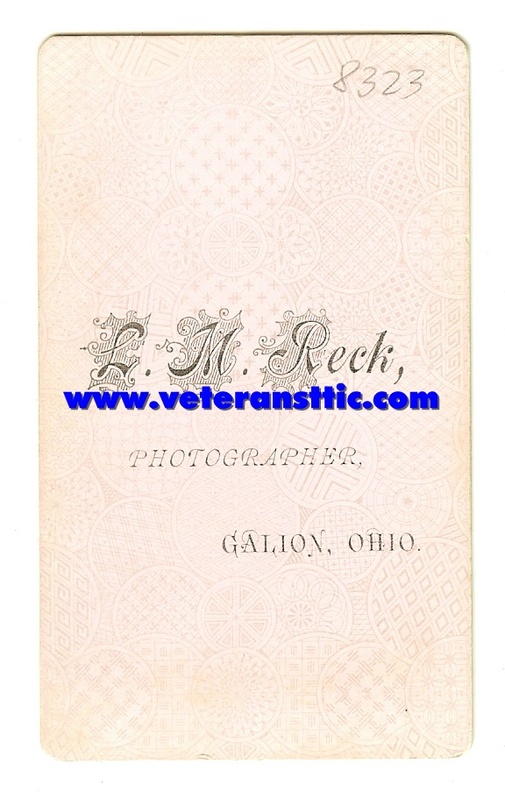 Reck, Photographer, Galion, Ohio". Here is a great photo of a seated GAR member. He is wearing his GAR hat, lapel pin, and a large ribbon that looks like a camp badge. I can't read it but it has a celluloid drop hanging and a celluloid hanger. This photo is approximately 3 inches by 4 inches total. Here is a nice photograph of a GAR Post Commander in uniform. 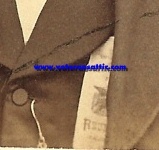 He is wearing his Post Commander's GAR badge and you can see the GAR buttons on his uniform. He is standing by a pedistal holding a rolled document. 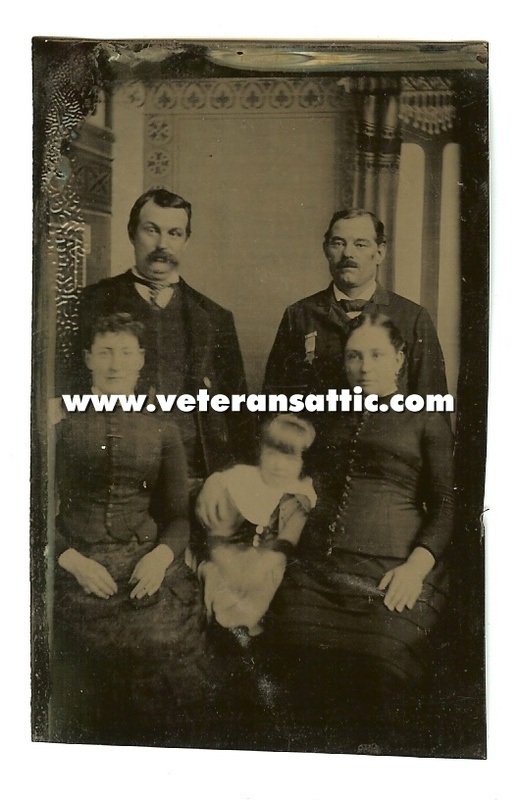 There is some light scratching on this cabinet card as seen in the photograph. There is no photographer mark or location mark.